2005-05-12 Assigned to HALLIBURTON ENERGY SERCIES, INC. reassignment HALLIBURTON ENERGY SERCIES, INC. ASSIGNMENT OF ASSIGNORS INTEREST (SEE DOCUMENT FOR DETAILS). Assignors: SAINI, RAJESH K.
The present invention relates to methods for treating subterranean formations. A method, that comprises providing a treatment fluid that comprises an aqueous fluid, and a degradable surfactant derived from a degradable polymer; and introducing the treatment fluid into a well bore that penetrates the subterranean formation, is provided. This application is related to co-pending U.S. application Ser. No. 11/128,060, entitled “Degradable Surfactants and Methods for Use,” filed concurrently herewith, the entire disclosure of which is incorporated herein by reference. An embodiment of the present invention provides a method of treating a subterranean formation. In an example of such a method, the method may comprise providing a treatment fluid comprising an aqueous fluid, and a degradable surfactant derived from a degradable polymer; and introducing the treatment fluid into a well bore that penetrates the subterranean formation. Another embodiment of the present invention provides a method of treating a subterranean formation. In an example of such a method, the method may comprise providing a foamed treatment fluid comprising an aqueous fluid, a gas, and a foaming agent comprising a degradable surfactant derived from a degradable polymer; and introducing the emulsified treatment fluid into a well bore that penetrates the subterranean formation. Among other things, degradation of the degradable surfactants may be sensitive to pH. For example, degradable surfactants comprising an aliphatic polyester hydrophobic portion degrade rapidly at a higher pH (e.g., about 9 to about 14) and may be most stable at a pH of about 6. On the other hand, degradable surfactants comprising a poly(orthoester)hydrophobic portion are stable at higher pHs, but poly(orthoesters) may degrade at pHs of about 8 or less. With an increase in temperature, the hydrolysis of the surfactant should become faster. The degradable surfactants should be suitable for use at temperatures that they will encounter during subterranean operations. Degradable surfactants containing a poly(lactic acid)hydrophobic portion are generally not suitable for use at bottom hole temperatures greater than about 150° C. However, degradable surfactants containing other hydrophobes, such as poly(caprolactone), may be suitable for use at higher bottom hole temperatures. One of ordinary skill in the art, with the benefit of this disclosure, should be able to determine the appropriate degradable surfactant to use based on, among other things, bottom hole temperatures that may be encountered. 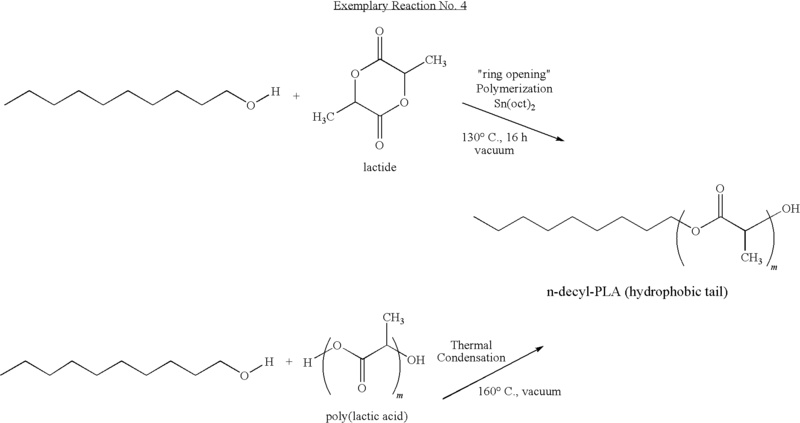 Additionally, polymerization of a monomethoxypolyethylene glycol-poly(ε-caprolactone) (mPEG-PCL) block copolymer (A-B type) also was performed according to the above procedure. However, instead of lactide, ε-caprolactone was used. Accordingly, Copolymer No. 6 was a mPEG-PCL copolymer having a number average molecular weight of 350-1,500 Daltons. And Copolymer No. 7 was a mPEG-PCL copolymer having a number average molecular weight of 350-1,500 Daltons. introducing the treatment fluid into a well bore that penetrates the subterranean formation. 3. 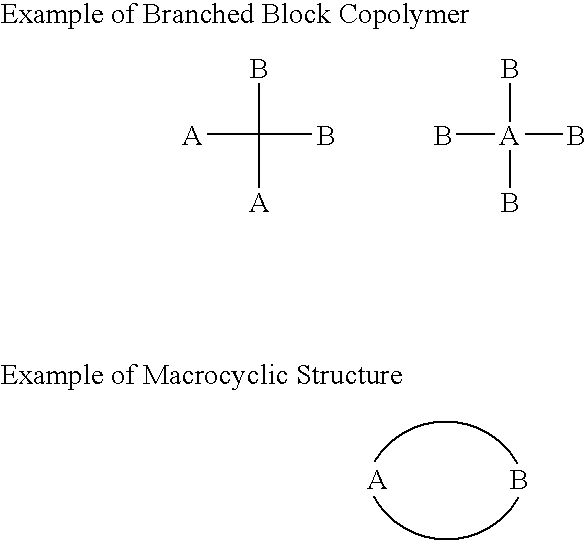 The method of claim 2 wherein the degradable block copolymer surfactant comprises a hydrophilic polymeric backbone grafted with a polylactic acid or a poly(caprolactone). 4. 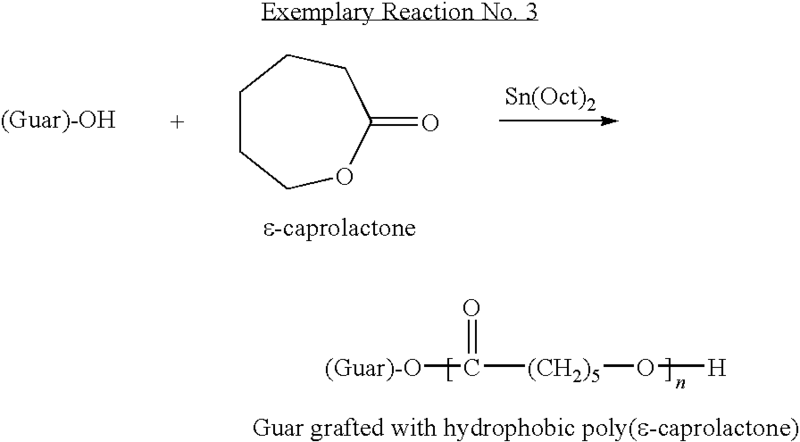 The method of claim 3 wherein the hydrophilic polymeric block comprises guar. 5. The method of claim 2 wherein the degradable block copolymer surfactant comprises a block copolymer of a poly(alkylene glycol) or a poly(alkylene oxide), and an aliphatic polyester. 6. The method of claim 2 wherein the degradable block copolymer surfactant comprises a quaternary ammonium degradable block copolymer salt. 7. The method of claim 1 wherein the degradable surfactant comprises a degradable polymeric surfactant that comprises an aliphatic polyester tail and a hydrophilic head group. 8. The method of claim 7 wherein the degradable polymeric surfactant is formed from a reaction that comprises at least one of the following: a poly(anhydride); a poly(orthoester); a poly(lactic acid); a poly(glycolic acid); a poly(caprolactone); a poly(hydroxybutyrate); a polyphosphazine; a poly(carbonate); a polyacetal; a polyetherester; a polyesteramide; a polycyanoacrylate; a polyurethane; a polyacrylate; or a copolymer thereof. 9. 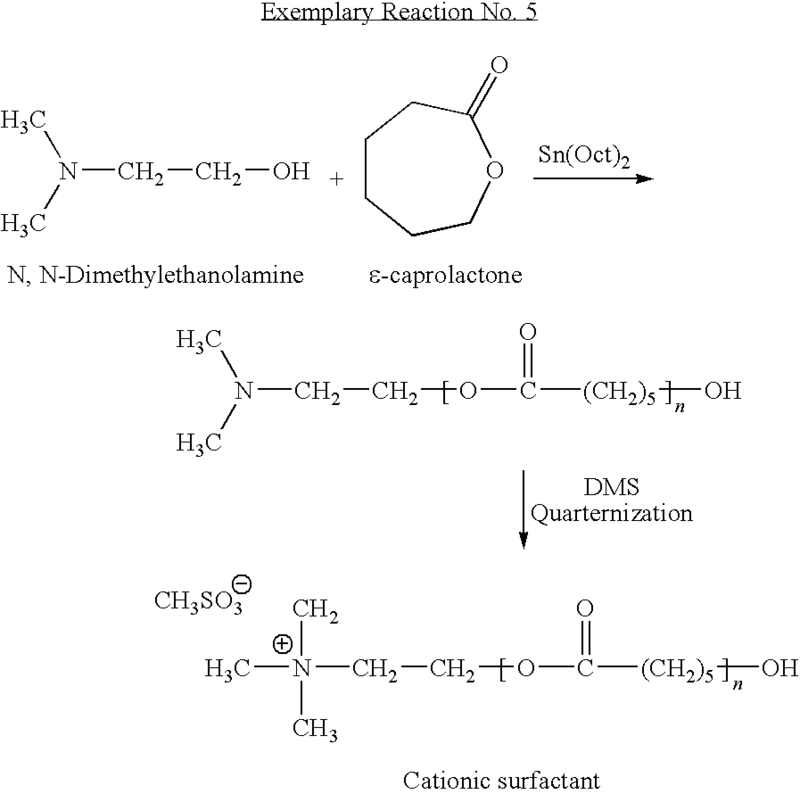 The method of claim 7 wherein the degradable polymeric surfactant comprises a quaternary amine cationic surfactant. 10. The method of claim 7 wherein the hydrophilic head group is an anionic group, a cationic group, an amphoteric group, a Zwifferionic group, or a non-ionic group. 11. 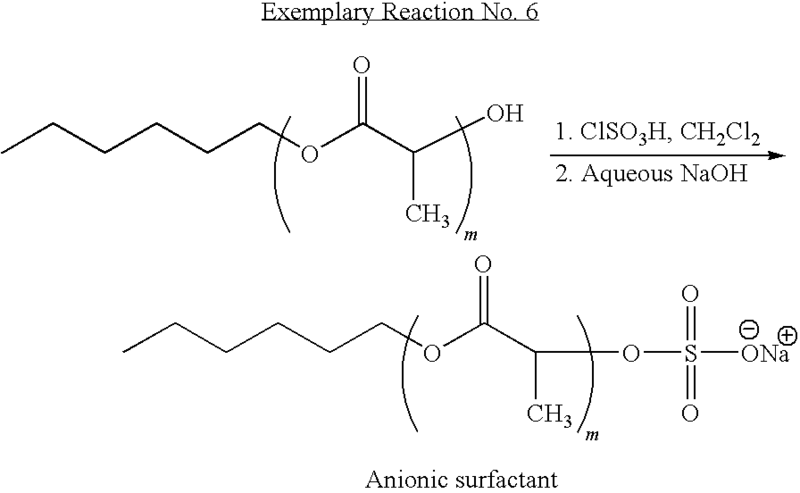 The method of claim 7 wherein the degradable polymeric surfactant comprises poly(lactic) acid or poly(caprolactone) with a head group that comprises a salt of a carboxylic acid. 13. The method of claim 1 wherein the treatment fluid is introduced into the well bore at a pressure sufficient to create or enhance at least one fracture in the subterranean formation. 14. The method of claim 1 wherein the hydrophilic/lipophilic balance is from about 3 to about 6 or from about 8 to about 18. 15. 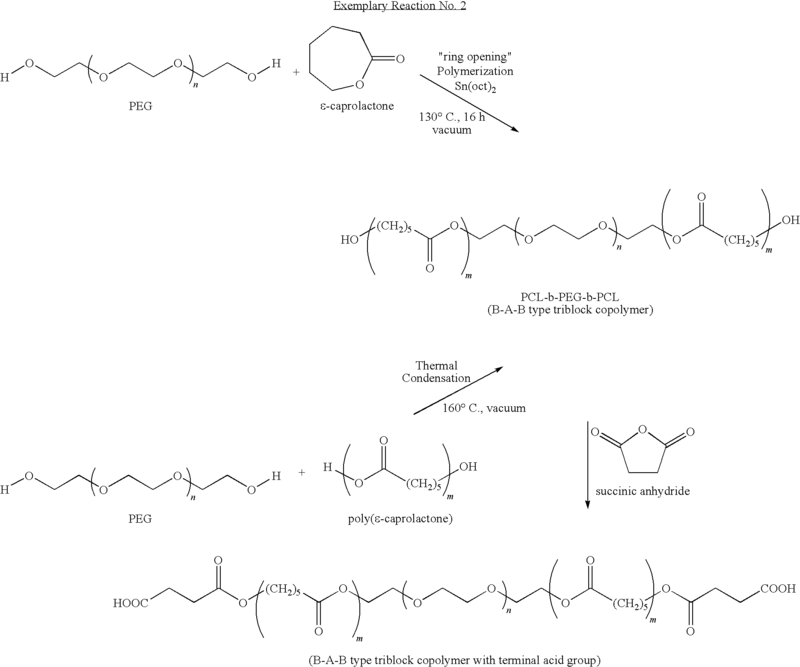 The method of claim 1 wherein the degradable surfactant comprises a degradable hydrophobic block attached to a hydrophilic polymeric block, the degradable hydrophobic block comprising at least one compound selected from the group consisting of: a poly(anhydride); a poly(orthoester); a poly(lactic acid); a poly(glycolic acid); a poly(caprolactone); a poly(hydroxybutyrate); a polyphosphazine; a poly(carbonate); a polyacetal; a polyetherester; a polyesteramide; a polycyanoacrylate; a polyurethane; a polyacrylate; and a copolymer thereof, the hydrophilic polymeric block comprising at least one compound selected from the group consisting of: a poly(alkylene glycol); a poly(alcohol); poly(vinyl pyrrolidone); a polysaccharide; a chitin; a chitosan; a protein; a poly(amino acid); a poly(alkylene oxide); a poly(amide); a poly(acid); a polyol; and a copolymer thereof. introducing the emulsified treatment fluid into the well bore. 17. The method of claim 16 wherein the degradable surfactant comprises a degradable block copolymer surfactant that comprises a hydrophilic polymeric block and a hydrophobic degradable polymeric block. 18. The method of claim 17 wherein the degradable block copolymer surfactant comprises a block copolymer of a poly(alkylene glycol) or a poly(alkylene oxide), and an aliphatic polyester. 19. The method of claim 16 wherein the degradable surfactant has a hydrophilic/lipophilic balance of from about 3 to about 6 or from about 8 to about 18. 20. 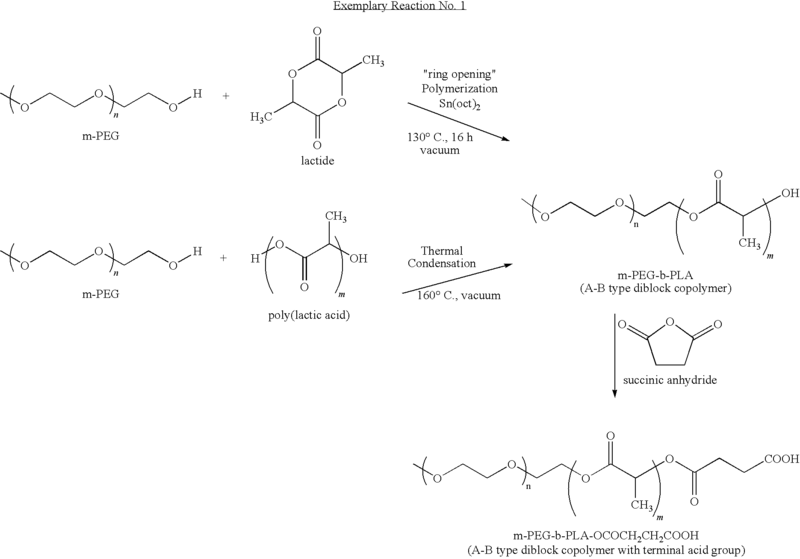 The method of claim 16 wherein the degradable surfactant comprises a degradable hydrophobic block attached to a hydrophilic polymeric block, the degradable hydrophobic block comprising at least one compound selected from the group consisting of: a poly(anhydride); a poly(orthoester); a poly(lactic acid); a poly(glycolic acid); a poly(caprolactone); a poly(hydroxybutyrate); a polyphosphazine; a poly(carbonate); a polyacetal; a polyetherester; a polyesteramide; a polycyanoacrylate; a polyurethane; a polyacrylate; and a copolymer thereof, the hydrophilic polymeric block comprising at least one compound selected from the group consisting of: a poly(alkylene glycol); a poly(alcohol); poly(vinyl pyrrolidone); a polysaccharide; a chitin; a chitosan; a protein; a poly(amino acid); a poly(alkylene oxide); a poly(amide); a poly(acid); a polyol; and a copolymer thereof. introducing the foamed treatment fluid into the well bore. 22. The method of claim 21 wherein the degradable surfactant comprises a degradable block copolymer surfactant that comprises a hydrophilic polymeric block and a hydrophobic degradable polymeric block. 23. The method of claim 22 wherein the degradable block copolymer surfactant comprises a block copolymer of a poly(alkylene glycol) or a poly(alkylene oxide), and an aliphatic polyester. 24. The method of claim 21 wherein the hydrophilic/lipophilic balance is from about 3 to about 6 or from about 8 to about 18. 25. The method of claim 21 wherein the degradable surfactant comprises a degradable hydrophobic block attached to a hydrophilic polymeric block, the degradable hydrophobic block comprising at least one compound selected from the group consisting of: a poly(anhydride); a poly(orthoester); a poly(lactic acid); a poly(glycolic acid); a poly(caprolactone); a poly(hydroxybutyrate); a polyphosphazine; a poly(carbonate); a polyacetal; a polyetherester; a polyesteramide; a polycyanoacrylate; a polyurethane; a polyacrylate; and a copolymer thereof, the hydrophilic polymeric block comprising at least one compound selected from the group consisting of: a poly(alkylene glycol); a poly(alcohol); poly(vinyl pyrrolidone); a polysaccharide; a chitin; a chitosan; a protein; a poly(amino acid); a poly(alkylene oxide); a poly(amide); a poly(acid); a polyol; and a copolymer thereof. Kiyoshi Matsuyama et al, Environmentally benign formation of polymeric microspheres by rapid expansion of supercritical carbon dioxide solution with a nonsolvent, Environ Sci Technol 2001, 35, 4149-4155. Office Action from U.S. Appl. No. 11/128,060, filed Mar. 25, 2008. U.S. Appl. No. 10/864,061, filed Jun. 9, 2004 Blauch, et al. U.S. Appl. No. 11/062,943, filed Feb. 22, 2005, Saini, et al..
U.S. Appl. No. 11/127,583, Saini, (Pending). U.S. Appl. No. 11/147,093, Todd, et al., (Pending). Y. Chiang et al. : "Hydrolysis of Ortho Esters: Further Investigations of the Factors Which Control the Rate-Determining Step," Engineering Information Inc., NY, NY, vol. 105, No. 23 (XP-002322842), Nov. 16, 1983. ES2265051T3 (en) 2007-02-01 Method for fracturing a subterranean formation using gelling acids. ES2254189T3 (en) 2006-06-16 Microemulsions water-in-oil useful for applications in the fields of oil or gas and methods for using the same.